“Any amount of smoking, even one cigarette, can double your risk,” said Tatiana Anderson, a post-doctoral research fellow at Children’s who worked on the study, which was published Monday in the journal Pediatrics. Final results of the were announced today. Mackey, Cohen and their colleagues captured first place in forecasting average temperature three to four weeks in advance and second place in forecasting total precipitation five and six weeks out. Today we’re excited to share a set of Guidelines for Human-AI Interaction. These 18 guidelines can help you design AI systems and features that are more human-centered. Based on more than two decades of thinking and research, they have been validated through a rigorous study published in CHI 2019. Why do we need guidelines for human-AI interaction? While classic interaction guidelines hold with AI systems, attributes of AI services, including their accuracy, failure modalities, and understandability raise new challenges and opportunities. Consistency, for example, is a classic design guideline that advocates for predictable behaviors and minimizing unexpected changes. AI components, however, can be inconsistent because they may learn and adapt over time. We need updated guidance on designing interactions with AI services that provide meaningful experiences, keeping the user in control and respecting users’ values, goals, and attention. We didn’t just make these up! They come from more than 20 years of work. We read numerous research papers, magazine articles, and blog posts. We synthesized a great deal of knowledge acquired across the design community into a set of guidelines that apply to a wide range of AI products, are specific, and are observable at the UI level. We validated the guidelines through rigorous research. We tested the guidelines through three rounds of validation with UX and HCI experts. Based on their feedback, we iterated the guidelines until experts confirmed that they were clear and specific. Let’s dive into the guidelines! The guidelines are grouped into four categories that indicate when during a user’s interactions they apply: upon initial engagement with the system, during interaction, when the AI service guesses wrong, and over time. 1. Make clear what the system can do. 2. Make clear how well the system can do what it can do. The guidelines in the first group are about setting expectations: What are the AI’s capabilities? What level of quality or error can a user expect? Over-promising can hurt perceptions of the AI service. PowerPoint’s QuickStarter illustrates Guideline 1, Make clear what the system can do. QuickStarter is a feature that helps you build an outline. Notice how QuickStarter provides explanatory text and suggested topics that help you understand the feature’s capabilities. 3. Time services based on context. 4. Show contextually relevant information. 5. Match relevant social norms. This subset of guidelines is about context. Whether it’s the larger social and cultural context or the local context of a user’s setting, current task, and attention, AI systems should take context into consideration. AI systems make inferences about people and their needs, and those depend on context. When AI systems take proactive action, it’s important for them to behave in socially acceptable ways. To apply Guidelines 5 and 6 effectively, ensure your team has enough diversity to cover each other’s blind spots. Acronyms in Word highlights Guideline 4, Show contextually relevant information. It displays the meaning of abbreviations employed in your own work environment relative to the current open document. 10. Scope services when in doubt. 11. Make clear why the system did what it did. Most AI services have some rate of failure. The guidelines in this group recommend how an AI system should behave when it is wrong or uncertain, which will inevitably happen. The system might not trigger when expected, or might trigger at the wrong time, so it should be easy to invoke (Guideline 7) and dismiss (Guideline 8). When the system is wrong, it should be easy to correct it (Guideline 9), and when it is uncertain, Guideline 10 suggests building in techniques for helping the user complete the task on their own. For example, the AI system can gracefully fade out, or ask the user for clarification. 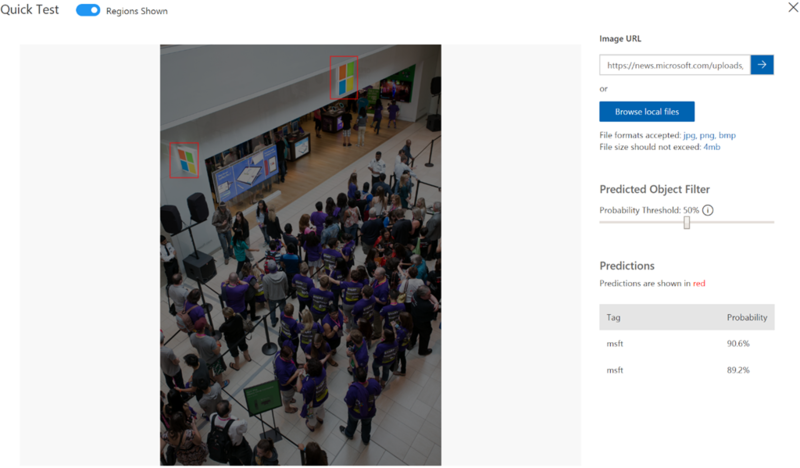 Auto Alt Text automatically generates alt text for photographs by using intelligent services in the cloud. It illustrates Guideline 9, Support efficient correction, because automatic descriptions can be easily modified by clicking the Alt Text button in the ribbon. 13. Learn from user behavior. 14. Update and adapt cautiously. 16. Convey the consequences of user actions. 18. Notify users about changes. The guidelines in this group remind us that AI systems are like getting a new puppy: they are long-term investments and need careful planning so they can learn and improve over time. Learning (Guideline 13) also means that AI systems change over time. Changes need to be managed cautiously so the system doesn’t become unpredictable (Guideline 14). You can help users manage inherent consistencies in system behavior by notifying them about changes (Guideline 18). If you’d like some more ideas, stay tuned for another post on this work where we share some of the uses we’ve been working with at Microsoft. We’d love to hear about your experiences with the guidelines. Please share them in comments. Download and print a set of cards with the guidelines and the accompanying poster. Mihaela Vorvoreanu is a program manager working on human-AI interaction at Microsoft Research. Saleema Amershi is a researcher working on human-AI interaction at Microsoft Research AI. Penny Marsh Collisson is a user research manager working on AI in Office. With thanks to our team who developed The Guidelines for Human-AI Interaction: Saleema Amershi, Dan Weld, Mihaela Vorvoreanu, Adam Fourney, Besmira Nushi, Penny Collisson, Jina Suh, Shamsi Iqbal, Paul Bennett, Kori Inkpen, Jaime Teevan, Ruth Kikin-Gil, and Eric Horvitz. Thanks also to Ruth Kikin-Gil for her thoughtful collaboration, and for curating examples for this post. Japan’s labor-intensive fish farming sector has taken a major step toward automation with the adoption of an artificial intelligence (AI) and Internet of Things (IoT) solution that frees up highly skilled workers from a crucial, but highly time-consuming, task. The breakthrough follows half a year of field tests at Kindai University, which plays a significant role in the national production of red sea bream – a fish known in Japanese as “Madai” that is prized by sushi and sashimi lovers both at home and abroad. The university’s Aquaculture Research Institute hatches red sea bream and raises them to a juvenile stage, known as fingerlings. Every year, it sells around 12 million fingerlings to fish farms that grow them to adult size for the market. To meet rising demand for the delicacy, Kindai’s workers must hand sort as many as 250,000 fingerlings a day. Fingerlings in a holding pen. Japan’s aging demographics and other factors have made the recruitment of experienced sorters difficult, particularly when so much repetitive work is required. To counter this problem, the university approached its long-term partner company, Toyota Tsusho, which in turn brought in Microsoft Japan to help come up with ways of automating a number of processes. The aim is to relieve workers of manually intensive duties so that they can focus their valuable skills on more demanding tasks. This latest innovation centers on software that automatically regulates the flow of water through pumps that transfer fingerlings from their pens and onto conveyor belts for sorting. IoT and AI tools continuously monitor and adjust the flows. Now automated … Fingerlings being pumped from their pens. Taniguchi said adjusting the water flow from a pump is crucial. The new automated transfer system was created with Microsoft Azure Machine Learning Studio using image analysis technology that recognizes the changing ratio of fish shapes and vacant areas within a pump’s pipes. From this, the system machine-learned how expert human operators adjust flows optimally. Field tests started last year, and within six months the system achieved the same flow control results as an operator. Taniguchi said employees, who often used to spend their whole working day just adjusting water flows, are now able to devote their time to applying their rich experience in streamlining other fish farming processes. They will also be able to pass on their technical knowledge to a new generation of aquaculture specialists. Sorting fingerlings on conveyor belts. He hopes greater automation will make jobs in the sector more attractive to younger workers looking to build careers. Given the accelerating pace of change around the globe, the worlds of school and work are undergoing massive transformations. New technologies such as artificial intelligence are empowering today’s students to address big challenges that motivate them, such as reversing climate change and slowing the spread of disease. At the same time, collaboration tools, mixed reality and social media are bringing them closer to one another than ever before. To successfully navigate these changes and to leverage the opportunities ahead of them, we need to prepare students with the diverse skills they will need in the future. To better understand how to prepare today’s kindergartners to thrive in work and life, last year we released research about the Class of 2030. Our findings highlighted two core themes: Student-centric approaches such as personalized learning and the growing importance of social-emotional skills. Social-emotional skills such as collaboration, empathy and creativity have long been essential, but our research revealed they have become newly important to employers and educators alike. Social-emotional skills are also necessary for well-being, which is a key predictor of academic and employment success. So this year we decided to dig deeper, to better understand what educators and schools worldwide are doing to enhance students’ skills and well-being and to understand how technology can help. We worked with the Economist Intelligence Unit (EIU) to survey more than 760 educators in 15 countries. From Mexico to Sweden and from Indonesia to Canada, we listened to the voices of educators. We also interviewed leading experts on and reviewed 90 pieces of research. What we learned is that educators around the globe are placing a high priority on student well-being and they are actively seeking ways to nurture it in their classrooms, across the school environment, and in their communities. According to the survey, 80 percent of educators believe that well-being is critical for academic success, for developing foundational literacies and for cultivating strong communication skills, and 70 percent of educators say well-being has grown in importance for K-12 students during their careers. At the same time, school systems have not moved as quickly as educators to prioritize well-being. Only 53 percent of educators said their schools have a formal policy in place to support students’ well-being. Individual educators can do great things in their own classrooms. But to impact well-being at scale, systemic approaches are needed. In addition, technology provides the critical scale to take any of these approaches beyond a single classroom. A complete summary of our research results will be released in March. In the meantime, we invite you to join our free webinar series on Teaching Happiness, starting February 25, 2019, for a broader exploration of the skills that empower students to lead happy and fulfilling lives. We are excited to be on this journey together with all of you, to learn from you, and to contribute our insights and our technologies to help every student on the planet achieve more.